Daikin’s SkyAir Fully Flat Cassette is a powerful, efficient and discreet solution for commercial, retail and residential applications where both aesthetics and performance are paramount. Daikin’s Fully Flat Cassette is the first cassette that fits fully flat with the ceiling, so it blends discreetly in with the room's decor. The FFA-A2VEB's new panels have been designed to integrate with standard ceiling tile dimensions, enabling lights, so it's easy to install a Daikin Fully Flat Cassette, and speakers and sprinklers to be in stalled in the adjoining ceiling tiles. To ensure perfect interior comfort Daikin's FFA-A2VEB Fully Flat Cassette can be fitted with an optional sensor* linked to an advanced controller. 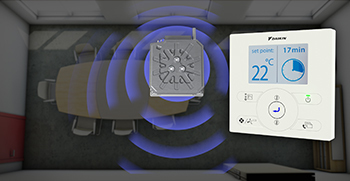 When there is nobody in the room, the presence sensor* adjusts the set point or switches off the unit, avoiding unnecessary cooling or heating and helping to reduce energy consumption. 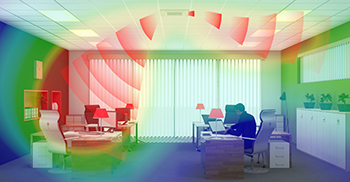 The sensor* also adapts the direction of the airflow depending of where people are situated in the room, reducing draughts and enhancing occupant comfort. When motion is detected the temperature is reset to its original setpoint ensuring perfect, energy efficient operation. Because heat rises, air is typically warmer near the ceiling and cooler near the floor. The FFA-A2VEB cassette’s ‘floor’ sensor* detects the temperature difference, redirecting airflow for more even temperature distribution. Daikin’s FFA-A2VEB Fully Flat Cassette delivers exceptional performance and efficiency throughout the entire year. An optional presence sensor also helps deliver even greater operating efficiency. Because air quality is as important as temperature for occupant comfort, Daikin's FFA-A2VEB Fully Flat Cassette features advanced filters to help remove dust particles to ensure the air is clean. The Fully Flat Cassette is one of the quietest units in the light commercial market and, in addition to the sensors, has various functions that are designed to enhance user comfort. Fully Flat Cassettes are managed from a user friendly remote control with an easy-to-read LCD display, enabling users to manage various system control configurations with ease, as well as control multiple indoor units from a single remote. Daikin’s focus on innovation has led to the development of cutting edge technologies for the provision of quiet, efficient air conditioned comfort, and a high efficiency compressor helps Daikin achieve an exceptionally high COP. By introducing high pressure oil, the reactive force from the fixed scroll is added to the internal force, reducing thrust losses and resulting in improved efficiency and suppressed noise levels. Powerful magnets: Neodymium magnets are 10 times more powerful than conventional ferrite magnets. Their use in Daikin’s DC motor delivers high torque from a compact compressor. Stronger materials: Casing strength has been increased by boosting the internal dome pressure. Optimal refrigerant configuration: Revised spiral shape and volume ratio result in the optimal refrigerant layout for more efficient operation. These two features work together to significantly reduce noise. Bell mouth intake guides reduce turbulence from fan suction, while the Aero Spiral Fan incorporates blade edges designed for smooth air flow, reducing turbulence even further. Escaping eddies are sucked in by the bent blade edges, reducing overall turbulence. By utilising high power permanent magnets instead of the induced magnetism of conventional AC motors, Daikin’s DC motor can deliver significantly higher motor efficiency, especially at low speeds. Note: Data based on studies conducted under controlled conditions in Daikin laboratories. Daikin’s Super Aero Grilles have also been designed for high air flow volume. Aero grilles not only look good, but help make your air conditioner efficient and reduce operating noise levels. Download the latest FFA Fully Flat Cassette Product Brochure for more information.